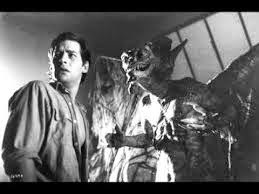 Of the three segments from Tales From the Darkside: The Movie, my hands-down favorite is “Lover’s Vow.” In it, stuggling artist Preston (James Remar) witnesses a monster kill a friend; the monster agrees with spare Preston in exchange for his silence. Preston then experiences amazing luck: he meets and falls in love with Carola (Rae Dawn Chong), then quickly gains acclaim and fortune as an artist. He maintains his silence for 10 years, until he tells Carola about the incident with the monster under the pretense of the honesty of love and his desire to never keep a secret from her. She then reveals herself to be the monster in human form, transforms both herself and their children, kills him and turns into a stone statue. It’s dark. No really, it’s literally dark – the lighting, setting and costuming is all done in shades of black, brown and grey. It doesn’t have a happy ending. It’s a messy version of love. As a preteen when I first watched this film, I felt that it was oddly familiar. Something about the story stuck out for me. Then, re-watching it on an overcast afternoon this past weekend, it hit me: this is The Little Mermaid retold. I was a little amazed that I hadn’t picked up on that before. 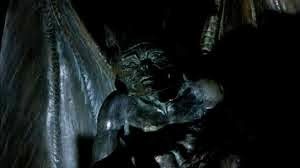 When the segment first opens, we see a gargoyle statue looking down on Preston’s apartment. The way that it’s positioned, it’s been watching him for some time. That his bartender friend Jer is killed is a little too convenient: this act gets Preston alone with the creature, who exacts a promise. The wording is interesting: it focuses on Preston’s speech. “If I let you go,” it tells him, “you must swear you’ll never say you saw me. Never say you heard me speak. Never tell anyone how I look. Never repeat what I have said.” This is a direct parallel to the story of the mermaid, who cuts out her tongue in exchange for legs. The creature exacts this promise to bind Preston into the same silence to which the mermaid is bound. Both the act of the murder and the promise prove to be a calculated way for Carola to worm her way into his life. Almost immediately, Carola appears. Preston’s first instinct is to protect her. Much like the story, he brings her to his home. Curious, she begins touching his work station at first. We see her inspect his work station as she remarks, “You’re the first real artist I’ve ever met.” She tests him successfully on their first meeting when she sees his wounds from the creature, as he does not tell her where he got them. The wounds, in fact, harken back to the original story: the mermaid is in pain when she walks on her new legs, but continues to do so in order to maintain her transformation. Oh, don’t mind me. I’m just stalking an artist. Carola’s test receives another try the next day. Preston leaves to check out the crime scene after he hears sirens. When he goes to leave, Carola doesn’t ask what’s wrong – she merely looks disappointed. When he doesn’t talk, she comes back with her bags and moves in. A third test arrives in the form of Preston’s drunken friend Maddox, who wants to know if Preston saw anything concerning Jer’s death. Carola witnesses Preston’s denial, ensuring their contract is intact. Within a short time frame, he’s a successful artist and she’s pregnant. All is well so long as he is silent. In the grand tradition of fairy tales, Preston does betray his promise, first with sight, then with speech. He creates sculptures and drawings of the creature, then hides them. This act of creation does not break the promise. Carola discovers part of the drawing, but does not say anything. It’s when he tells her about his experience that she changes. The secretive fragment of a drawing she seems to be able to live with because it does not violate the contract. It’s the act of speech that breaks the promise and voids their contract, causing her transformation. Up until this point, it appears as though Preston has taken on the role of the mermaid; however, the wording of the exchange between Preston and Carola post-transformation is easy to miss if you’re not paying attention to the semantics. After all, Preston was the one that got the amazing Faustian deal: life, art career, beautiful partner, children. However, Carola explicitly states that he broke his promise, and it’s “too late.” When Preston begs her to stop the change, she replies that she can’t. This turns the situation into Carola’s Faustian deal: in order to remain human, Preston, like the prince, must uphold his end of the bargain. In story, this was the form of marriage, which the prince would not provide to the mermaid. When Preston does not uphold his end of the deal, she is compelled to kill him to save herself. In the story, the mermaid chooses to die rather than kill the prince to save her life. In this case, though, Carola has her children with which to contend. They transform as well. She chooses her life and their lives over their father’s life. She has stalked him, tested him and built a life with him. She declares her love for him. She is truly sorry that she can’t remain human, and that she is compelled to kill him. She does kill him, which alters the meaning of the story. Her regression back to the creature she is defeats the transformative purpose of the story, and places a different twist on the 80s theme of transformation. Yeah, this totally didn’t go the way she planned it. The notion of transformation is something that ran rampant in the 80s. How many movies featured someone masquerading as someone or something they weren’t? Roxanne, Can’t Buy Me Love, Soul Man – just a few, but all featured a lead that felt the need to lie about their appearance and/or circumstances in order to achieve something. Typically, these stories involved a romantic partner that would not have gone for that lead under normal conditions. In the end, the true nature prevailed, and the couple was able to move forward with the honesty. This is not the case in “Lover’s Vow.” The broken promise ups the ante in this respect: while most films of the 80s featured this theme and ultimately had the lead get the girl in the end, this one goes folk tale style on the theme: it treats the deception as contract enforcible by death. This is a rather damning take on the light-hearted transformations of the 80s. No, you can’t be just anyone. You can’t escape your true self. Sometimes, you sign up for something and you have to live with the consequences. You don’t criticize a theme more harshly than that. Somehow, I don’t think these two kids are going to make it. In the end, Carola reverts back to her creature form, hiding as a stone statue. Instead of watching over Preston’s apartment, she’s facing the other way with her children in a pose of mourning. Her transformation failed, and now she’s frozen in a state of emotional agony with her children. In the end, love didn’t transform. Love brought about the true self, ugly as it was. I really enjoyed your take on this, I saw it as a kid and “Lovers Vow” has stuck with me ever since. It should have been it’s own film. Thank you! You know, I had the same reaction as a kid — I think it came from reading some of the less-sanitized versions of fairy tales. I hope modern cinema keeps giving us more of the adult fairy tale flavor.